Although getting admitted off of the waitlist can and does happen, please keep in mind the number of admits is very low. Some schools waitlist thousands of applicants, only to offer a few hundred spots (or 0, or 20, or 50) in their incoming class. 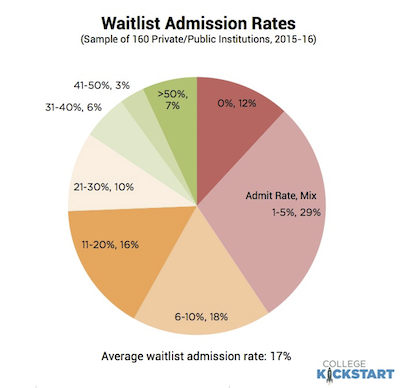 They note there are several factors driving low admit rates, including the size of the waitlist (often very large), and how well a school anticipates its admissions yield—I agree. So what can you do if you have been deferred or waitlisted? Write a waitlist letter. This letter should contain information updating the school on what you’ve been up to both inside and outside of the classroom since the time you applied. It should also be used to reiterate interest and a commitment to attend if applicable. *If you are not 100% committed to attending, do not say so in the letter. Have your guidance counselor call the admissions office and advocate for you. Ask them to back up what they say on the call in an email and ask them to provide additional information that supports your candidacy. Make sure updated grades/transcript are sent promptly. Visit the school and swing by admissions to reiterate interest. Sit in on a class, stay overnight, take advantage of any admissions events/programming you may not have during your initial application process. Obtain and have an extra letter of recommendation sent. This letter could be from a teacher, coach or someone else close to you who can speak to what you have to contribute to the university. *Side note on alumni letters­ and letters from well-known and or famous people. Many students ask if these are helpful to send, and the answer is no, they are not unless the person really knows you. If you think that a big name vouching for you will help, it generally doesn’t as a stand-alone factor, and officers can see through these often brief and less than meaningful notes. Again, getting admitted off of the waitlist can happen, but it is a wise idea to get excited about the schools where you were admitted and focus on choosing which one will be the best place for you to spend the next four years!